American formation Fiction 8 has been always a bit of mystery to me. Set up in the 90s their sound always reflected elements of ‘pop’, but still something ‘dark-wave’ like. 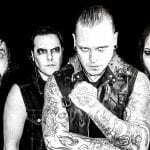 The band driven by Michael Smith released albums on different labels such as Discordia, Matrix Tube/Trinity, Nilaihah Records and Erisian Records. “Dark Star Disarray” was their first self-released work (2015) after a silence of seven years. And now Fiction 8 is already back with a new album entitled “The Bleak Disease”. This is what front man Michael Smith has to say about it. Q: I realized that Fiction 8 is already active for more than 25 years now! I think there were some breaks, but in the end the band released by the end of 2018 a new album. How did you see Fiction 8 evolving throughout the years and what kind of band are you today? Michael: When we released “Chaotica” in 2000, I thought we were exactly where we needed to be, musically. It took a while to really figure out our sound. We then spent the next few years getting off track and doing things we thought other people wanted. We got to a point where making music wasn’t much fun anymore and so we didn’t record a lot. Over the course of the last few years though, we’ve worked our way back and are once again making music that sounds like Fiction 8 to me. I’m really happy with “The Bleak Disease” and the new music we’ve done since then. Q: I think that Fiction 8 rather sounds as the result of multiple influences running through your songs instead of being part of a music genre. It definitely makes the originality of your work, but still a real challenge to catch the attention of media, promoters… and maybe labels. What’s your opinion about that? Michael: Yeah, I agree that we don’t fit in to any one genre. I spent a while writing with a particular genre in mind, but those songs always sound forced and not very genuine to me, so I generally just try to write with a feeling in mind. Nowadays, I just like to make up a rule or two for each album and try to stick to it. Trying to fit into genres will turn your art into product, but having internal rules and challenges help. You have to do something to challenge yourself to get better at your craft. Otherwise, you just churn out the same record over and over again. For “The Bleak Disease”, the rule was ‘no guitars’. I wrote everything with a keyboard and focused on keeping it electronic. Q: That’s strange, you say that the rule was ‘no guitars’, but “The Bleak Disease” feels like an album in two parts; the first half, which sounds more electronic-like and the second half, which is more dominated by guitar play. So what is it all about? Michael: You have a good ear. That’s absolutely right. Yeah, that was really the result of “Dark Star Disarray”. We wrote 20 to 25 songs during the writing phase for that album. Some of the songs were easy to cut, but we eventually settled on 15 songs to record, figuring that 12 or 13 would probably go on the album and 2 or 3 more would be set aside for one reason or another. As the recording wrapped up, the album became incredibly difficult to sequence and we ended up cutting it down to 10 songs that seemed to work together. We were really happy with 4 of the other songs but just couldn’t make them fit, so rather than tossing them out, we decided to add them to the next album. So, the last 4 songs on “The Bleak Disease” were the ones recorded during the “Dark Star Disarray” sessions. Q: After the album “Dark Star Disarray” (2015) your new work “The Bleak Disease” is another self-released work, which next to the digital/streaming format, is also available on CD. I can imagine it’s not that evident working in a ‘DIY’ approach. What’s your experience so far and what are the advantages/disadvantages? Michael: We enjoyed working with the labels that we did and appreciated all the help and support we got along the way. But it did get to a point for me where I was worrying more about what the I thought the labels wanted and less about the music we were feeling. The irony was probably that if we’d just made the music we were feeling, the labels probably would have been happier with the result. The nice thing about the DIY approach is that we don’t have to worry about schedules, lead times, territories, or anything like that. If we want to release a song or an album on a given day, it’s live on Bandcamp immediately and live on other streaming platforms in a couple of days. The digital rights, in particular, had become untenable for us. It had become an ugly, Kafka-esque experience trying to figure out who was stomping on whose feet and claiming digital rights they didn’t have. It got to a point where we were spending more time in business administration than making music. Q: I noticed you don’t have plans to play live again. That’s an interesting point because of the streaming today vs. decreasing CD sales, a lot of artists are searching for live gigs. How comes Fiction 8 is different here? Michael: I was really disappointed to hear that Rudy had disbanded :Wumpscut:. I don’t know if he did it because studio music was no longer profitable enough to justify the effort or what, but it was a turning point for me. I never really enjoyed playing live and always felt like I was doing it for promotion, but I had never stopped to think about the negative impact it was having on the music. When you make an album, you get into a groove. The last songs you record during the sessions are usually your best. But then the album is done, so you stop, you send off the album to be mastered, and you go on tour. You come back to your studio 6 or 9 months later and you’ve forgotten a lot. Making your next album becomes less about building on what you’d learned from the previous album and more about starting over from scratch. It’s a really inefficient and uncreative way to work. Past that though, consumers and streaming services have devalued recorded music to the point that bands have to constantly tour if they want to make any money. Streaming has become to music as plastic is to food. People want the convenience of prepared foods packaged in plastic, but they ignore the damage to the planet caused by all of that waste and convenience. Streaming services force bands onto the touring circuit and ruin recordings in the process. Bands can no longer spend a year in the studio if they need to, making their best work. It’s all about light shows, pyrotechnics, and merchandise now. Q: But you already have plans for an EP with remixes and even a next album. Can you give us more details about the content? Michael: After finishing “The Bleak Disease”, my new rule was ‘don’t stop’. The day the album was released, I had already recorded the first song for the next album. I wanted to stay in the groove. By the end of 2018, we had 15 new songs and most of them are really sharp. Frankly, we could have already released the next album by now, but I wanted to keep writing new material and give those 15 songs time to simmer and get even better. At the same time, we’d been getting feedback about which songs from “The Bleak Disease” were being played at clubs and on radio shows and so forth. So, rather than push the next album out the door, we wanted to put together an EP of remixes of some of those songs to maybe promote them a bit further, as well as preview the next album with a couple of new tracks. We’re also coming up on the 20th anniversary of recording “Let Go” so we decided to put together a couple of remixes for that one as well. What started as an EP has evolved into a remix album.